We provided grants directly to carers who look after someone with Motor Neurone Disease (MND), and to people with MND who have a carer who will also benefit. The project covers the whole of Scotland. To date we have delivered respite services to 2 young people and 3 carers, a 5 week arts club and an 8 week photography club. Young people have gone out for dinner, gone to the pantomime, visited local fetes, had walks along the beach, massage/girly pampering sessions, visited local parks, taken lots of photographs, made lots of art works and held an exhibition. The project has delivered 61 one to one sessions for 27 young people aged12-20 years and provided respite to 50 carers .The coordinator has carried out 27 detailed assessments of needs for 27 young people and 50 assessment of needs for 50 carers. Young people have been supported by staff to plan and access activities e.g. attending local youth clubs, meet friends for cinema and bowling trips, participate in community events, visits to the science centre,art gallery , shopping , sports etc. Carers have been able to access gyms, visit relatives, pursue hobbies, relax and have time to themselves. We delivered a holiday club for 19 pupils from Corseford School over 10 days during the Summer Holidays.The Club daily hours were 10am-4pm. Staff were recruited from existing school staff on a 1:1 ratio. All carers and pupils were surveyed before the Club and as a result,a range of activities were offered eg speed boats, barge trips, archery, bowling, accessible cycling,swimming. Activities tailored to each child’s age and abilities. Week 1 for the younger pupils and week 2 for older. Where requested, taxis and trained escorts were provided for the journeys.This significantly extended the break each family enjoyed. We held a summer club in July 2013 with a variety of activities and outings for young people to choose from. We are also offering an after school club four nights per week with escorted transport included. The summer club was extended by a week and exceeded its target for carers respite hours. 14 young people rather than the planned 12 attended. We provided a 2-day break for families at Ardentinny Outdoor Education Centre in Argyll. 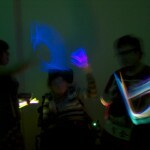 Thirteen children and young people with epilepsy attended, along with 36 carers including young carers. We provided transport, accommodation, catering, outdoor adventure activities and entertainment tailored to meet the needs of our group. Children and young people took part in gorge-walking, canoeing, abseiling and archery with their peers. Adults enjoyed sailing, orienteering, archery and canoeing. Families worked together to complete “team challenges”. We also enjoyed a guided night walk, a disco, a quiz, a surprise birthday party and an “Ardentinny Champions” awards ceremony. 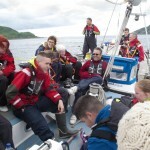 West of Scotland Sailing adventure – In July 2013 10 blind and partially sighted CYP sailed from Oban aboard Alba Volunteer for a 5 day/4 night sailing adventure. 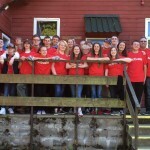 Promoting Independence Summer Camp – Broomlee – This 5 day/4 night residential was attended by 15 YP aged 14-18. The focus was on independent living and transition. It included workshops on developing confidence, assistive technology, cooking skills, independent travel, personal care, employability, preparation for post-16 transition, outdoor activities and loads of fun! 5 weekly Out of School Clubs :- These have been delivered at Knowetop Primary in North Lanarkshire; Uddingston Grammar School, South Lanarkshire; Aberdeen Visual Impairment Service, Aberdeen City; Darnley Primary School, Glasgow; Eyebeez Club, Hamilton. Each club is regularly attended by 10-15 children. Family Fun Day (Borders) :- We had an Outdoor Adventure Activity Day for all the family on 2nd November 2013. Attended by 20 children and young people with 15 parents and 8 volunteers. The emphasis was on team building and confidence development. Despite torrential rain all the families had an excellent experience. In Forth Valley and Fife – Fun day at the Time capsule, an animal fun day where young people interacted with animals at a petting zoo. Young people went to the autistic showing of The Lion King. A young person who missed out on The Lion King went to the Beauty and Beast Pantomime. 4 hour session to ‘Sensations’. In West Dunbartonshire – summer play sessions accessing community facilities 48 hours of service delivery, 3 days per week for 4 hours each days and 2 hours on Saturday mornings for 6 weeks operating our drama and music group. "The games, meeting other young people , working well together and knowing you're not alone."